I stayed several days in Deinze and in addition to looking over the town, there were things to do on the boat. I think I have used or tested all the things on the boat that I needed to know about except for one. Using the washing machine when not plugged into shore power. We have two sets of batteries on the boat, simply labeled house and engine. It is possible with a switch to use one or the other or both. 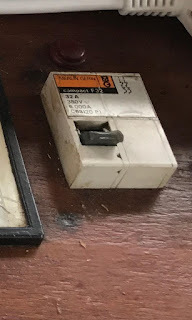 Perhaps best practice is when you are not connected to shore power to change the switch so that only the house batteries are being used. It is the hope then that when you need to start the engine you have a strong pair of batteries to produce the 24 volts needed. good sun exposure. Prior owners have suggested a much shorter wash run to save on water and electricity. I probably didn't follow that suggestion to a T. But it ran fine and the voltmeters dropped just a little. I had not changed the switch to be using just one bank of batteries – the house batteries. For a second load I chose to start the generator so that 220 volts could be produced directly for the house, bypassing the batteries. I had a little trouble with this. Last year, when I was looking to buy the boat we started the generator but did not actually use power from it. I took videos and notes and I thought I was proceeding as I should. But no 220. After a period of head scratching watching the old video and looking at my notes, I was stumped. So what does someone like me do with this type of problem? I called on Barrie on the Silk Purse. He came over to the boat and we scratched our heads for a period of time and then he said: “What is this 32 amp switch on the control panel for?” I knew immediately that was the answer. I had turned it on and off several times but never tested for 220 volts when it was on. So our solution was found – turn on the switch dummy and also hook up the battery charger since the generator was running. But the excitement was not totally over. The sun was shining, I thought the solar panels were working as they should, but the next morning when we wanted to depart for a trip I could not start the engine. Now for this I knew the answer. Start the generator, produce 220 volts, plug in the battery charger and charge the batteries. Barrie stopped by just to make sure I was doing it right. After about an hour of charging we were able to start the engine and begin our trip. Now I believe I have tested and used all the important systems on the boat and I am ready for anything. Sure. Regress. The night before, with only the light from the computer screen, I noticed movement out on the water. This is what I saw – 3 Canadian geese going down stream in a row and between the first and second adult were 4-5 babies and between the second and third adult 4 or 5 more babies. Convoy. Not sure this is normal practice but perhaps Jim and Sue who hang around the ornithology lab at Cornell might know.